JAPAN: Manufacturer Hitachi has unveiled a new version of its 5MW offshore wind turbine, with a new rotor size and uprated output. Hitachi has increased output of its 5MW downwind turbine to 5.2MW, the manufacturer said. A prototype of the 5MW turbine has been operating at an onshore test site in Kashima City since March 2015. 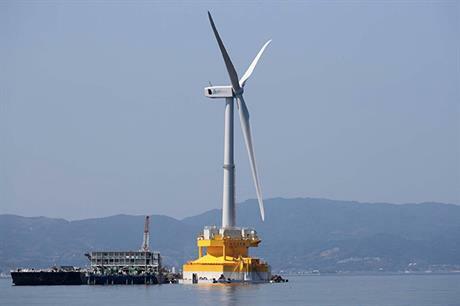 Additionally, it will be available with two rotor sizes: the previous 126-metre option has been boosted to 127 metres, and a new 136-metre option will be made available for lower wind sites, particularly along the coasts of Japan's main island, the company said. An onshore prototype of the turbine is due to be installed at the Fukashiba project in Kashima Port, east Japan, in October. The company said it hopes to release the turbine in 2017. A version of Hitachi's 5MW turbine with the 126-metre rotor is currently installed on a floating platform as part of the Fukushima Forward project further north along Japan's eastern coastline. The Hitachi turbine is the last of three to be installed at the Fukushima Forward test site, which also features Mitsubishi Heavy Industry's 7MW turbine on a floating foundation. A Hitachi 2MW floating turbine has been installed at the site since 2013. In September 2015, Hitachi announced plans to add a 5MW production line at its facility in east Japan.